There’s a candidate only 11 million miles away: Small but active Comet Hartley 2 is making one of the closest approaches to Earth of any comet in centuries. It turns out that the orbits of the two fireballs were not only similar to one another, but also roughly similar to the orbit of the comet. Moreover, meteoroids from Comet Hartley would be expected to hit Earth’s atmosphere at a relatively slow speed–just like the two fireballs did. Two fireballs with “Hartley-esque” orbits observed on Oct. 16th by cameras in western Ontario (left) and the southeastern USA (right). Credit: UWO/NASA/Bill Cooke. SS: see the starmaps below of hartley in the stargate orion region yesterday and today .. this region is one of two places where the milky way crosses the ecliptic . the other is in the mayan hunab ku galactic center .. this is the upraised torch of orion of the astral light . so having the moon meet hartley well timed in this region is not coincidence just as the hartley fireballs above are not coincidence .. we have moon and hartley in the orion stargate and anytime we see a moon and a star this is the silver star ..
2010 Sept Hartley Teardrop Fireball! SS: someone must have seen my blog .. i post the volcano with the tsunami because i think the phenomena is related . this is not the first time we have seen big earthquakes in indonesia region while volcanoes were active . i have much data logged shows the same phenomena . it is interesting to see my theories are beginning to be realized by scientists . a lot of my theories are based upon long term monitoring of phenomena .. see the map and links below for location of tsunami and the volcano . Tsunami, Volcano Eruption in Indonesia Linked? October 27, 2010 This week’s Indonesian tsunami and volcano eruption might be linked, scientists say. The tsunami was triggered by a magnitude 7.7 earthquake that hit at 9:42 p.m., local time, on Monday near the western island of Sumatra. The resulting waves killed more than 300 people. (See an Indonesia map.) A few hours later the 9,700-foot (3,000-meter) volcano Mount Merapi, on the eastern island of Java, blew a pillar of hot ash and debris into the sky, killing at least 30 people living on its slopes. (See pictures of Mount Merapi erupting.) Mount Merapi, Indonesia’s most active volcano, had been building up steam for several days. But the timing of the main burst so soon after the earthquake raises the question of whether the shaking ground set off the eruption—even though the epicenter of the quake was 800 miles (1,300 kilometers) away from the volcano. SS: it was a pretty big tsunami across the entire indian ocean . see the previous post for location map . also read about how tsunami’s cause atmospheric gravity waves . they said that “adding that as the wave travels through thinner and thinner material, the larger its oscillations can get.” .. oscillations they grow and develop over time . the tsunami occurred just as hartley tear is moving into the orion stargate region which i will talk more about soon .. the tsunami occurred sunday night and my priestess was having ice cream cake .. below link has a movie of the tsunami . Tsunami Event – October 25, 2010 Mentawai, Indonesia The Indonesia tsunami event was generated by a Mw 7.7 earthquake (3.484°S, 100.114°E ), at 14:42:22 UTC, 240 km (150 miles) W of Bengkulu, Sumatra, Indonesia (according to the USGS). In a little under 2 hours, the tsunami was first recorded at DART® buoy 56001 and in a little under 3 hours, the tsunami was recorded at DART® buoy 56003. Forecast results shown below were created with the NOAA forecast method using MOST model with the tsunami source inferred from DART® data. Tsunami hits after Sumatra earthquake Tuesday, October 26, 2010 » 10:10am There are reports of a three-metre tsunami following an earthquake off Indonesia’s Sumatra island last night. Australian Rick Hallett has told the Nine Network he was on his charter boat with guests when the wall of water rolled into their bay in the Mentawai Islands. He said it picked up one boat and pitched it towards theirs, which burst into flames and exploded. Mr Hallett said he’d ordered everyone onto the top deck and they threw anything that floated into the water, including surfboards and fenders, and jumped in. He said several of them were carried 200 metres inland and scrambled up trees where they stayed for an hour and a half as the sea heaved. Tsunamis create mysterious atmospheric waves: Scientists Washington, October 15, 2010 Tsunamis which often cause huge destruction on land also make a surprising impression even 300 km high above the Earth, scientists say. According to researchers, tsunamis generate mysterious “atmospheric gravity waves” and their better understanding would help gather better data on the potentially devastating ocean-based waves and improve tsunami warning networks. “The tsunami very effectively generates atmospheric gravity waves, and because they’re fast, those waves can effectively travel to the upper atmosphere,” said Michael Hickey, a physics professor and associate dean at Embry-Riddle Aeronautical University in Florida. Astronomers who wish to monitor this small but active comet should point their optics at the constellation Auriga high in the northern sky before dawn. Moonlight will make finding the comet a little tricky. On the bright side, reading the finder chart will be a breeze! SS: the hartley tear is now moving out of auriga the charioteer. it will now begin to move into the orion stargate region where it will rendevouz with the moon . this will be the actual peak of the comet passage which i will explain the significance in future blog .. hartley’s activity almost mimics holmes* outburst on a smaller scale .. i will continue this great work tonight . Ipsissimus (10°=1□): Beyond the comprehension of the lower degrees. An Ipsissimus is free from limitations and necessity and lives in perfect balance with the manifest universe. Essentially, the highest mode of attainment. This grade corresponds to Kether on the Tree of Life. 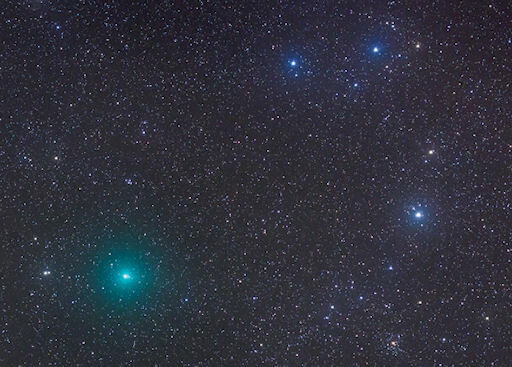 TIME TO SEE COMET HARTLEY: For backyard stargazers, now is the best time to see green Comet 103P/Hartley 2 as it approaches Earth for an 11-million-mile close encounter on Oct. 20th. Set your alarm for the dark hours before dawn, go outside, and look straight up. You will find Hartley 2 not far from the bright star Capella: sky map. Although the comet is barely visible to the unaided eye, it is easy to find in binoculars and looks great through a backyard telescope. “Apart from the blue-green color, this view matches what the comet looked like visually through large binoculars — a round fuzzball,” says Dyer. 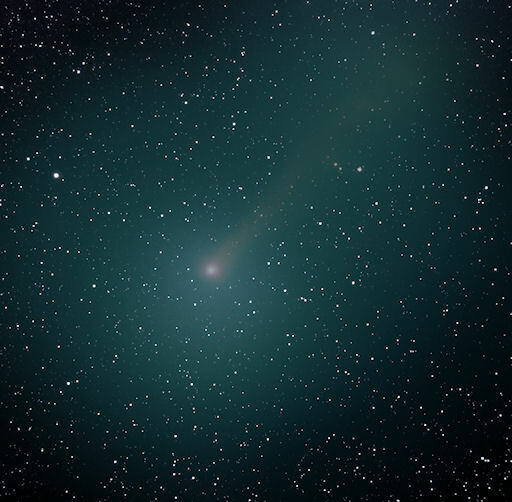 Many readers have asked, why is the comet green? Answer: Hartley 2’s green color comes from the gases that make up its Jupiter-sized atmosphere. Jets spewing from the comet’s nucleus contain cyanogen (CN: a poisonous gas found in many comets) and diatomic carbon (C2). Both substances glow green when illuminated by sunlight in the near-vacuum of space. Chinese comet hunter Bo Zhou found the sundiver on Oct. 19th in SOHO coronagraph images. Heated by intensifying solar radiation, the icy comet has brightened 100-fold since Zhou’s discovery to approximately 1st magnitude. 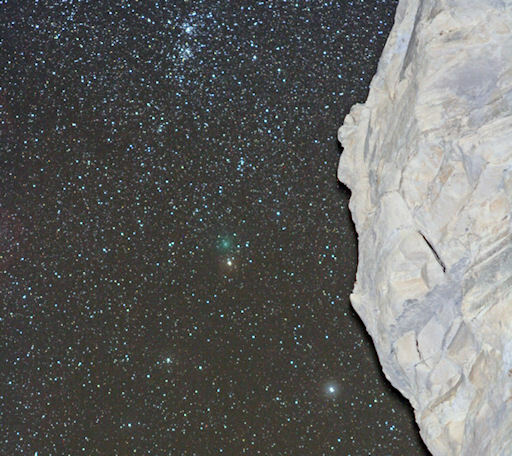 If this comet were in the night sky, it would be a spectacular sight. Instead, it will probably be destroyed behind the opaque disk of SOHO’s coronagraph as it attempts to swing around the sun at all-too-close quarters. The comet is likely a member of the Kreutz sungrazer family. Named after a 19th century German astronomer who studied them in detail, Kreutz sungrazers are fragments from the breakup of a giant comet at least 2000 years ago. Several of these fragments are thought to pass by the sun and disintegrate every day. Most are too small to see but occasionally a big fragment like this one attracts attention. SS: these sungrazers plunge into the sun fairly often it is these bright ones happen a few times per year . @NASA says these sungrazers are from a comet that was disintegrated in the inner solar system 2000 years ago. well that could be but we also have quite a few comets that enter the inner solar system and disintegrate as well. so is this sungrazer part of a comet that disintigrated 2000 years ago or is it part of say S4 linear that disintegrated in 1999, or even more recently the first beestinger disintegrated as well.the truth is we don’t really know .. it is my personal theory that any comet that disintegrates into the inner solar system will likely end up in the sun ..
SS: but what we do know is when a sungrazer plunges the sun there is usually always a solar flare . i have recorded it over and over again and again . which this phenomena proves that these comets are fuel to the sun, same as the space dust . it is because comets are still in primordial pristine form since the protostar stage . SS: you know that the priestess – queen is greek. we have priestess artifacts show greek amazon priestess . ancient greek traces back to egypt . that is why it is a multi-god myth because hermes was actually thoth .. here is the big picture . priestess is very complicated . SS: earlier this year an asteroid collision occurred in the beehive crown . the difference between a comet and an asteroid is the difference between direct light and reflected light. the comet being venus is the direct light while the asteroids are reflected light like the moon the reflects the astral light we see the reflection of the collision . Hubble captures aftermath of asteroid collision 13 October 2010 An international team of astronomers has observed what happens after asteroids crash together. Using Hubble to study the aftermath of one such collision over five months, they watched a strange, comet-like debris trail slowly evolve as the collision site orbited the Sun. This research gives clues about how asteroids behave when they collide, and how the fall-out from these impacts contributes to the dust that pervades the Solar System.